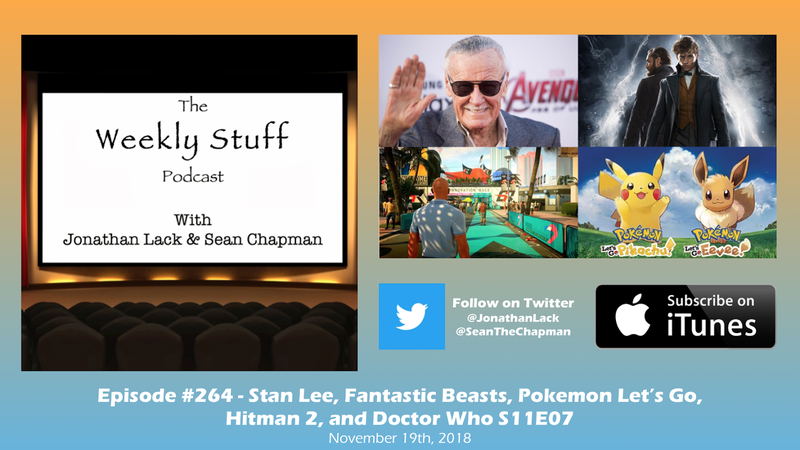 It’s time for another episode of The Weekly Stuff Podcast with Jonathan Lack & Sean Chapman, a weekly audio show that explores the worlds of film, television, and video games. You can subscribe for free in iTunes by following this link. In one of the single busiest episodes we’ve ever recorded, we pay tribute to the amazing life of Stan Lee, the face and voice of Marvel comics and one of the most dominant figures in modern pop culture, review Fantastic Beasts: The Crimes of Grindelwald, give first impressions of Hitman 2 and Pokemon Let’s Go, go over several pieces of news including Sony’s decision to skip E3 2019, and review the latest episode of Doctor Who, “Kerblam,” which may well be the worst – or, at the very least, most morally and thematically bankrupt – episode in the 55-year history of the series. It’s 4 jam-packed hours of content for your Thanksgiving week travels, time spent cooking, or if you just need to get away from your family and listen to us yell about British mass media. Subscribe for free to 'The Weekly Stuff' in iTunes! Follow Jonathan Lack on Twitter! Follow Sean Chapman on Twitter! The Weekly Stuff with Jonathan Lack & Sean Chapman is a weekly audio podcast, and if you subscribe in iTunes, episodes will be delivered automatically and for free as soon as they are released. If you visit www.jonathanlack.com, we also have streaming and downloadable versions of new and archival episodes for your listening pleasure.